Le confort et la propreté . Le gîte est décoré avec goût et est très bien équipé. La personne qui nous accueille est très sympathique . logement spacieux et bien agencé, très bien équipé. Propreté parfaite. La situation, les ustensiles, les appareils ménagers à disposition dans l'appartement, l'accueil, la discrétion et l'hospitalité. Le calme et les paysages, une belle région ! Lock in a great price for La Source Du Pre Masset – rated 9.4 by recent guests! One of our best sellers in Métabief! Located in Métabief, La Souce Du Pré Masset is 5.6 mi from the Swiss Border and 2,950 feet from Morond Ski Elevator. This self-catering apartment offers free WiFi and a living room with a flat-screen TV. The apartment has 3 bedrooms and a living room with a flat-screen TV. The bathroom is complete with a bath and a washing machine is provided. The open-plan kitchen is equipped with kitchenware, a fridge and a microwave. An oven, a stove and a dishwasher are also at guests’ disposal. Activities around La Source Du Pre Masset include skiing, cycling and horse riding. Free parking is possible on site. This property also has one of the top-rated locations in Métabief! Guests are happier about it compared to other properties in the area. 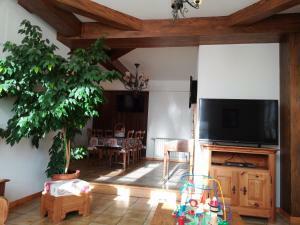 This property is also rated for the best value in Métabief! Guests are getting more for their money when compared to other properties in this city. When would you like to stay at La Source Du Pre Masset? Located on the ground floor, this self-catering apartment offers free WiFi, 3 bedrooms and a living room with a flat-screen TV. A washing machine is provided. House Rules La Source Du Pre Masset takes special requests – add in the next step! Please note that bed linen rental is available at the property. Please note that checks are an accepted method of payment. Please inform La Source Du Pre Masset of your expected arrival time in advance. You can use the Special Requests box when booking, or contact the property directly using the contact details in your confirmation.